Nicole Foss has the final part of "Negative Interest Rates and the War on Cash" here, which looks forward to the implications of the financial elites maintaining their own privilege through starving the peasants to death, as happened in the global financial collapse of the 1300s. The sequential destruction of dissenting nations can be seen with the wars upon Iraq, Libya, Syria and currently Venezuela. The spoils may directly pay for such wars, or merely contribute to the health of the global empire of finance, military, propaganda and covert action. When all money is electronic, your every act will be predicated upon the good graces of your rulers. To have your funds frozen is the perfect form of shunning. What could you even beg at the corner? We are headed into severe deflation, and since the late 1990s, almost-free bubble-money has been directly provided to top financial elites. They have purchased houses, farms, copper, iron, oil, everything of substantial value, to which they now hold legal title, while the regime persists. You and I may become unnecessary to them soon. We should try not to be a bother. Indigenous peoples continue hundreds of years of resistance to colonialist power. In Denver, Colorado, taxi drivers have formed a large cooperative enterprise, Green Taxi Cooperative, with 800 drivers/members, but just a few of those valuable slots at the airport, which are clearly not proportional, and are being reassigned soon, in an opaque process, which may further choke them out, in favor of Uber, and soon, robo-cabs. Ron Paul discusses the deep-state, "secret government", that controls and is unaffected by voting. Congressman Paul advocates being politically active, with a reasonable understanding of the actual power structure, to guide objectives. Legislation allowing victims of 9/11 to sue countries which are not on the "State-Sponsors-of-Terrorism" list may soon be permitted to sue Saudi Arabia, which may divest itself of US Treasuries and other holdings, in retaliation. 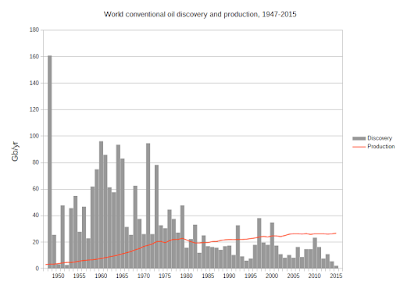 "Since 1980, when the gap between production and discovery began to appear, humanity has extracted about 47 percent more conventional oil than it has discovered."